The simple answer to what is a good credit score depends on what you’re pulling it for. What you’re looking to do with your credit will determine how your score is calculated. Meaning, if you’re looking to buy a home then the score will have more of an emphasis on items that relate to buying a home. The same is true for buying a car or applying for a credit card. So what would be a good credit score? In the U.S., there are three national credit bureaus (Equifax, Experian and TransUnion) that compete to capture, update and store credit histories on most U.S. consumers. While most of the information collected on consumers by the three credit bureaus is similar, there are differences. For example, one credit bureau may have unique information captured on a consumer that is not being captured by the other two, or the same data element may be stored or displayed differently by the credit bureaus. 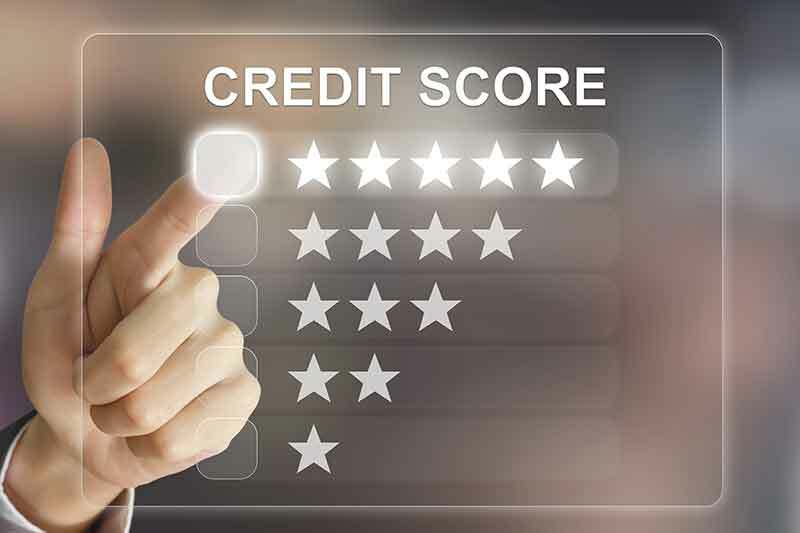 A predictive FICO scoring system resides at each of these credit bureaus from which lenders request a FICO® Score when evaluating a particular consumer’s credit risk. The FICO scoring system design is similar across the credit bureaus so that consumers with high FICO Scores on bureau “A’s” data will likely see a similarly high FICO Score at the other two bureaus and conversely consumers with lower scores at bureau “A” will likely get a low FICO Score at the other two bureaus when the underlying data is the same across the bureaus. Not all credit scores are “FICO” scores. So, make sure the scores you are comparing are actual FICO Scores. The scores should be accessed at the same time. The passage of time can result in score differences due to model characteristics that have a time based component. Comparing a score pulled on bureau “A” from last week to a score pulled on bureau “B” today can be problematic as the “week old score” may already be “dated”. Basically, it’s saying that all three of the bureaus use similar scoring models and that if a score is significantly different from one bureau to another is because the data is different from bureau to bureau. A simple rule to follow is that the highest score and lowest scores are irrelevant and the middle or “mid” score is the one most lenders will go with. 35% Payment History – This is the biggest portion of your score and is based on paying your bills on time. This applies to original creditors because they’re the ones that can legally report payment history. In addition, there’s different type of accounts like; revolving and installment. 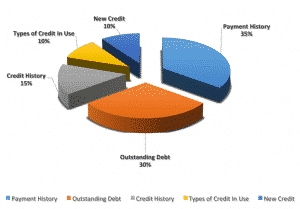 30% Outstanding Debt – This portion is made of your debt to available credit ratio and collection accounts. Debt to available credit means how much do you owe on an account versus how much given credit. E.g. If you have a credit card with $500 of available credit and a balance of $250 then you at 50% of your debt to credit ratio. Tip- keep all credit card balances under 50% of available credit for a positive impact and 30% for an even better affect. 15% Credit History – This portion is made up of how long you’ve had credit. Meaning, from what date did you initially establish credit. The longer the better. 10% Types of credit in use – This portion of your score is made up the types of credit you use. The scoring likes to see a healthy mix of revolving (credit cards), unsecured installment loans (personal loans, etc. ), secured loans (home loans, auto loans, etc.). 10% New Credit – This portion is determined by newly opened accounts and inquiries. What is a good credit score useful for? The quick answer is there isn’t a quick answer. Financial freedom is the best quick explanation for the use of good credit; from something as small as obtaining good auto insurance rates to something as big as purchasing a home. Purchasing a home is one of the biggest uses of credit for a consumer. Your average consumer does not understand the amount of money which is thrown away due to poor credit scores; from renting a house to paying unnecessarily high interest rates on a mortgage. For example if you obtain a mortgage loan for $100,000 you will pay $1,000 for each percent of interest. Therefore, your $100,000 home loan at 4.5% interest will cost you a total of $186,000 over the life of the loan. This is somewhat of the same concept when purchasing a car. Used car dealerships will charge 19-20+% interest on an auto loan. Depending on the loan terms you could end up paying Luxury car price for a cash car. This doesn’t include utilities, auto insurance and other lines of credit that also rely on a person’s credit score.